Drive in/Late Check-In: After 10:00 PM If you know you will be a late drive in you will need to reserve a private room. Please call ahead to check availability. Property and Cancellation Policies:Shared Rooms: Cancellations must be made 3 days (72 hours) before check-in. CALL for all cancelations DO NOT email us. Payment with groups 4 or more must pay on one card. We do not split the bill with large groups checking in bunks. Private Rooms: Cancellations must be made 7 days before check-in. Groups of 6 or more: Cancellations must be made 14 days before check-in. Groups of 12 or more: Contact hostel directly by emailing rattleriverhostel@gmail.com or calling 603-466-5049 to reserve. Special conditions, including a 30% non-refundable deposit apply. All cancellations made without appropriate notice charged 30% of total reservation cost. Cancellations within 24 hours of check-in (including no-shows) will be charged the greater of EITHER 30% total reservation cost OR 100% of first night cost. Families with children under 12 years old are required to call when booking reservations. IIf you have a sleep condition (ex: snore, sleep apnea) that may disturb others, you are REQUIRED to book a private room. If you have a sleep condition (ex. snore, sleep apnea) that may disturb others, you are REQUIRED to book a private room. No exceptions. If you are driving in please understand that this is a hiker hostel during the summer. Coming in later than 9PM will disturb others that are sleeping in bunk rooms. Therefore you are required to rent the entire cottage or private rooms. This is to protect everybody's sleep. If you are checking in past 10PM please make arrangements prior that day. If you do arrive late please do not slam your car doors. The Rattle River Lodge and Hostel (formerly White Mountains Lodge and Hostel) steps away from the Appalachian Trail, is a gateway to the Presidential range of the White Mountains and has the Carter-Moriah range in our backyard. 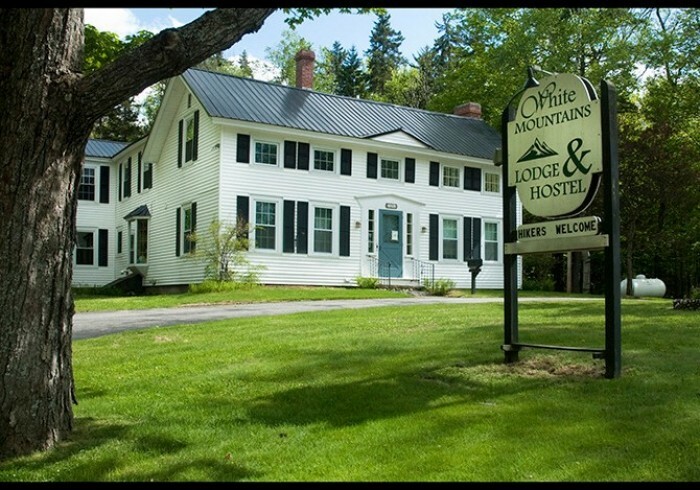 Built in 1877, this New England colonial has undergone multiple renovations to create an inviting and relaxing environment for our guests after they enjoy a day in the White Mountains hiking, skiing/snowboarding, climbing, or kayaking. The Lodge, which sits on seven beautiful acres adjoining the White Mountain National Forest, accommodates up to twenty-six guests in shared rooms, and private rooms. Our serene backyard boasts a patio, picnic table, pond and fire pit. Walk a short distance through our grounds to enter a wooded paradise bordering the Rattle River. Guests relax, refresh and regroup in our quiet homelike setting. Read, play music, watch television and collaborate with fellow hikers in the comfortable living room. Hot coffee available every day and make your own pancakes are available to guests.